The New High Performance Gator bed sprayer is designed to work with the New 550 Series Gator. With a 45 gallon capacity, high volume electric pump, and premium pistol grip spray gun, it provides an excellent way to apply spray materials such as liquid fertilizer, weed killer, tree spray and deicer. It is the perfect match for the customer who wants extreme performance. Custom brackets secure Gator to bed for a NO TOOLS mount. Cover ground quickly with flexible boom options; a 150" precision folding, 120" Standard 3 tip, 30' boomless, or no boom at all. (boom sold separately). 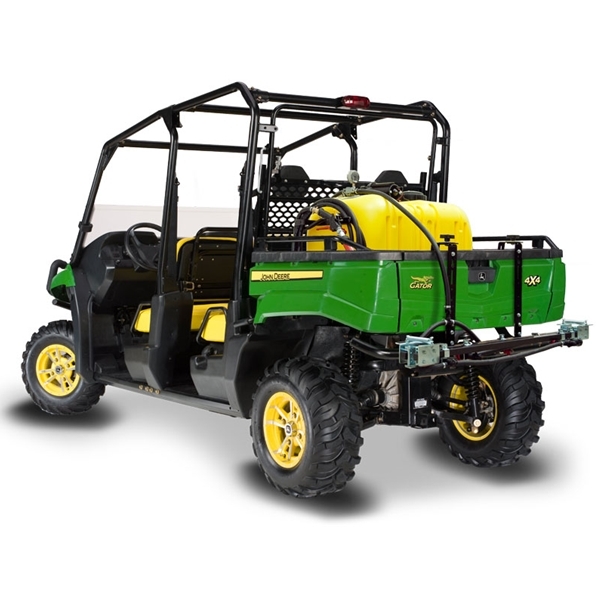 120" Standard Spray Boom - This fixed boom is conveniently sized at 43" and does not extend wider then the Gator Bed, but it is perfect for covering ground quickly and thoroughly with a 120" spray swath. It is ideal for basic spraying application. Three tips and check valves round out this offering. Boom only, mounting brackets are provided with sprayers. 150" Precision Spray Boom - This folding boom is made to cover ground quickly and thoroughly with 5 precision spray tips, TeeJet nozzle bodies and commercial grade diaphragm check valves.. The outer tips offer versatility with built-in shut offs to allow an adjustable 90", 120" or 150" spray swath.